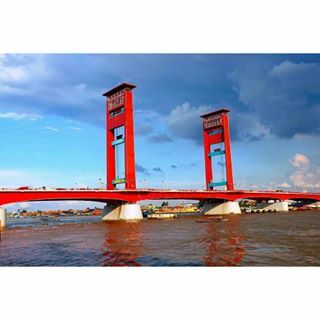 Palembang is potentially earn a share of tourist arrivals, because it has the power of tourism as the existence of Musi River in the middle of town. Place image is pertinent for various reasons, such as attracting tourists and highly skilled employees, encouraging government officials and investors to fund and develop, as well as promoting self-confidence and civic pride among local residents (Bramwell and Rawding 1996; Kavaratzis and Ashworth 2005). In the context of tourism, studies of place image have commonly examined the notion of tourism destination image (e.g., Andrades-Caldito, Sanchez-Rivero, and Pulido-Fernandez 2013; Prayag and Ryan 2012), which has been documented to significantly influence people’s choice, experience, and behavior associated with a tourist place (Chen and Phou 2013; Lin etal. 2007; Qu, Kim, and Im 2011). Come up with the term ‘Venice of Indonesia’ for the city of Palembang, it can grab romance travelers in Asia because this is where its strength, but again, how the city government to raise all parties to promote and market it. To promote it, the local government can work together with the Association of travel agencies and hotels, to form a special agency for the promotion of the region such as Bali and Yogyakarta. This promotion is the most important part and cannot be underestimated in tourism. How do people want to come if they do not notice its existence. Most importantly, the city government should use the low cost promotion through social media because it is more effective if they want to attract more tourists from Singapore. Palembang will be the major destinations throughout the region, especially in Southeast Asia in the future, because it has a historical and cultural proximity. As many as 74 per cent of Singaporeans are of Chinese descent and here there is a special affinity with Chinese culture, but it is much more uniting the Malay language because Singapore is also use it. Palembang city has a number of potential tourist destination, namely religious tourism, culinary tourism, shopping tourism, historical tourism / heritage. Religious tourism in Palembang, namely Kemaro island, always packed with thousands of people of Chinese ethnics to celebrate the Chinese New Year because there is a Hok Tjing Rio temple along with its mate finding legend. The desire to work on tourists from Singapore and Asia has also expressed by the Association of Travel Agencies of South Sumatra province. South Sumatra Board of Promotion beliefs, before focusing on targeting countries in Asia, the city government should beautify tourist sites and improve facilities and infrastructure. If you want to enjoy water travel, there should be large and nice ships, rather, outdated one as it is today. As a travel agency that takes care of travelers, they often hear complaints they were worried the boat would sink. Likewise, tourist Island, Kemaro island, has bungalow around the island, but, supposedly this bungalow fully utilized to provide other facilities such as jet ski, diving tools, and more. Feasibility of tourism infrastructure should be a concern for the local administration into a promotional tool to tourists. Those who come to Palembang expected to tell all her relatives and want to come back there. But, if left an unfavorable impression it is not possible not to come anymore. The association was expecting the city government’s attention to the tourism sector, given the steadily declining since the beginning of the year. Last year, there were three to four groups from Malaysia to Palembang in every month, but now only one to two groups only. Number of tourists visiting South Sumatra, about 3 million people per year, while this year the Department of Culture and Tourism of South Sumatra province targets to increase rapidly to redeem 5 million people until the end of 2015. To boost this, city government focus on the tourism sector this year by working with state-owned company, PT ITDC tourism developers to build a five-star hotel with 20 floors, immediately stood near the Musi River. 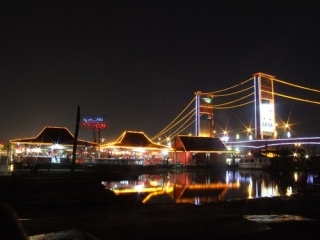 PT Indonesia Tourism Development Corporation (ITDC) has shown seriousness to build a hotel on the banks of the Musi River by describing the initial design of the construction of a five-star hotel and it need of funds of Rp200 billion. Now, it’s time for South Sumatra won the blessing of the tourism sector as they already well-known abroad for his role to host various international sport.